FIXYOURTHINKING.COM / Need a brain? Borrow mine! 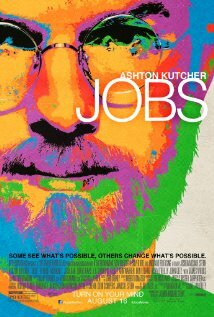 : Thank You Steve Jobs For Inspiring This Movie To Be Made! Thank You Steve Jobs For Inspiring This Movie To Be Made! I learned to program on an Apple ][C (1980-1983). I got a Mac in September of 1984, nine months after their introduction. Ever since, I have pretty much lived my life dependent upon Apple products for my income, writing, and creative process. I have worked for Apple, beta tested products, and worked on my own, selling, repairing and networking Apple computers. Steve Jobs, made out to be a god by most of the tech industry, was an insanely driven person. He is an inspiration to me - not to become god-like - but to be known for something other than vanity, fortune, or fame. I would like to be remembered for being unique and irreplaceable. Steve Jobs is certainly that. This movie follows the life of Steve Jobs from dropping out of college to form Apple Computer to his death. The movie is well acted by Ashton Kutcher. You may consider the life of Steve Jobs boring to anyone but a geek, but I highly recommend you see this movie. It seems to be a very accurate portrayal of a life that is inspirational.